In part 1 of this tutorial I have showed you how to install Exchange 2010 SP1 multi-tenant (or in hosting mode). Today we will go over the process of creating and deleting organizations and mailboxes mailboxes. Before doing a jump start and create an organization we need to take a look at some files located on your CAS server called Service Plans. Service plans are located by default in “C:\Program Files\Microsoft\Exchange Server\V14\ClientAccess\ServicePlans” of your CAS server and they define the different services your hosted organization provides to its customer. Each .SevicePlan above presents a set of permissions/features/quotas etc.. and their names are self explanatory. 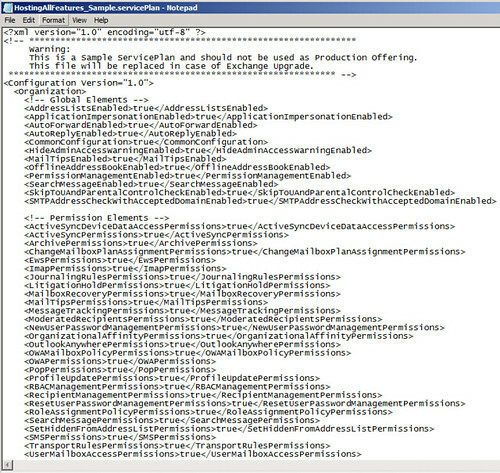 However if you need to change or create you own ServicePlan the file itself is an xml file, just start with the HostingAllFeatures_Sample.ServicePlan and remove any entry you don’t want and/or change any value. N.B. : Make sure NOT to use the sample plans if you edit them since they will replaced by any update done on the server. This will prompt you for a username and password, you can input any username you want since all we need from this command is the password. The password specified is going to be used for the administrator of the organization you are about to create. That was not that complicated right ! But what happened on the Active Directory side ? As you can see a dedicated OU was created for the TestOrg organization with its Administrator user and its own Security groups. Pretty cool hein ! Don’t worry yet about the extra user “Antoine Khater” we will see how to create it in the Part 3 of this tutorial. To finish today’s article I will go over the process of deleting an organization. And as you can imagine in will do all the cleaning from Active Directory as well. That’s it for today, in part 3 of this tutorial we will see how to manage your organization. I have created 2 organizations. shouldnt there be 2 databases?? Hi, Can I use same domain name for multiple orgs? If we have some generic domain which smaller orgs can use which dont have own domain? when you specify a password with get-credencial REMEMBER to give a complex one otherwise the others command will give you many errors. How would you create an organization that has multiple domains. Ex: TestOrg has domain TestOrg.com and TestOrg.ca. TestOrg.com would be primary, but some users would have TestOrg.ca alias addresses. How can this be done? One of the few brilliant step by step guide of something very rare. Hosted Exchange is something which you dont usually find on web but this site is amazing. Followed all the steps and I have Mail Exchange with hosted environment. I have followed step 1 – everything installed without a hitch. I tried to setup new OU and am getting an error. Am I doing something wrong? Any help would be appreciated. Thanks for the reply. However, I am using exchange management shell. I just did a fresh install (windows server and exchange) to make sure I am doing everything right and still getting the same error. Any ideas??? Hi Antoine, followed your steps but get the following error? Can you help? Great tutorial by the way these are rare! The process failed to read the Exchange topology in the allotted time. 4 Pings/Trackbacks for "Step-by-step Starting with Exchange 2010 SP1 multi-tenant: Create and delete organizations"